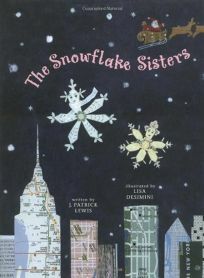 Following their Doodle Dandies and Good Mousekeeping, J. Patrick Lewis and Lisa Desimini present The Snowflake Sisters, a story in verse about two snowflakes who tag along on Santa's sleigh, manage a trip to Times Square in time to see the ball drop on New Year's Eve and wind up in Central Park, affixed to a snowman's shoulder, until spring brings a thaw. Lewis has his way with T.S. Eliot (""Let us snow then, you and I,"" says one snowflake sister to another), and throws in some other jokes. Desimini's collages include such dazzlers as a Times Square scene made of cut-up advertisements, intricate snowflakes constructed from New York City bus and subway maps and more.